Canton, NY – June 30, 2014 – Piper Klemm PhD LLC of Canton, NY, acquired the equestrian publication, The Plaid Horse, from previous owner, Cindy Taylor on June 1, 2014. The Plaid Horse, known as America’s Premiere Horse Show Magazine, is distributed at rated, unrated and intercollegiate horse shows across the country. The publication recently celebrated its 11th anniversary serving the horse show industry. “I have admired The Plaid Horse for years,” said Dr. Piper Klemm. “After contributing articles and photographs over the last couple years, I was presented with the opportunity to acquire the publication and help set its course for the future. My first goal is to continue Cindy’s great work in serving the horse show community." 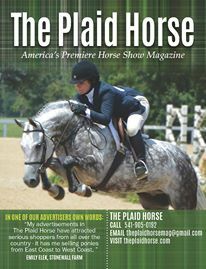 The magazine will continue to provide the current content that readers know and love, while expanding the reach of its website, mailing list and social media to include current horse show news, news about advertisers and informative articles.The Plaid Horse can be found daily on its news feed (theplaidhorse.com/news), Facebook, Instagram, Twitter and Pinterest. Taylor, remains the owner of sister publication, The Paisley Pony Magazine, and will continue to manage that publication, while Dr. Klemm will now take charge ofThe Plaid Horse. “I am thrilled for the prospects of The Plaid Horse under Piper’s direction and I look forward to focusing my energy on The Paisley Pony,” said Taylor. Dr. Klemm also holds a Ph.D. in Chemistry from the University of California, Berkeley, and is the CEO of Klemm Hill LLC, a chemical company. She has written and contributed photography for various equine publications as a freelance writer covering major events such as the USEF Pony Finals and grand prix classes across the country. The next issue of The Plaid Horse will be its annual pony issue, available at horse shows across the country, including USEF Pony Finals, HITS Saugerties Pony Finals, and The Menlo Charity Horse Show. Ad submission deadline is July 10. For more information or to request a media kit, please visit www.theplaidhorse.comor email theplaidhorsemag@gmail.com, 541-905-0192.